GLENDALE, Ariz. - The New England Patriots stopped the Seattle Seahawks from repeating as NFL champions in Super Bowl XLIX with a goal line interception in the last minute of the game after what seemed to be the Seahawks taking advantage of a nearly dropped pass that placed them within yards of a win. But Russell Wilson's pass into the endzone was picked off by cornerback Malcolm Butler, ending the Seahawks' chances of winning, and vindicating the Patriots after two weeks of controversy, 28-24. But the Patriots (15-4) had to survive a last-ditch drive by the Seahawks (14-5), who got to the 1, helped by a spectacular juggling catch by Jermaine Kearse. Then Rookie Malcolm Butler stepped in front of Ricardo Lockette to pick off Russell Wilson's off-target pass and complete one of the wildest Super Bowl finishes. Brady leaped for joy on the Patriots sideline after Butler's interception. 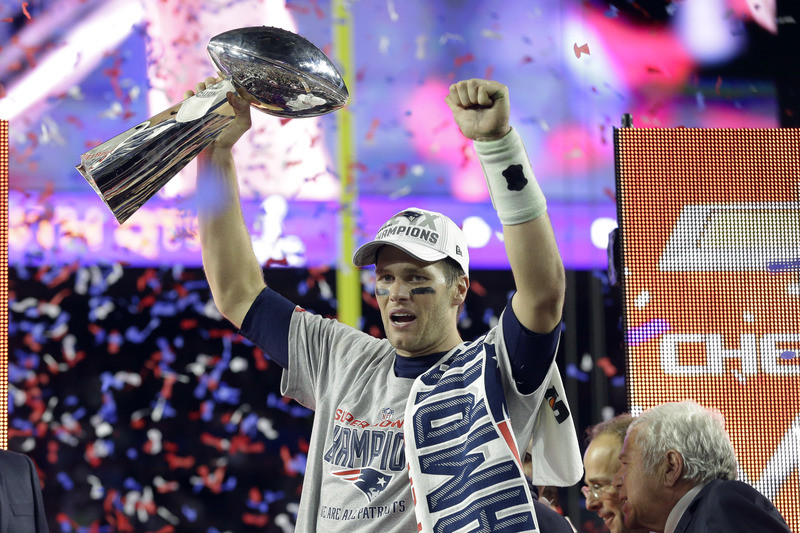 "It wasn't the way we drew it up," said Brady, who won his third Super Bowl MVP award. Seattle didn't quit - it never does - and Kearse's 33-yard catch with 1:06 remaining got it to the 5. Marshawn Lynch rushed for 4 yards, then backup cornerback Butler, who was victimized on Kearse's reception, made the biggest play of his first NFL season with 20 seconds remaining. Having never caught a pass in the NFL, Matthews grabbed four for 109 yards and a touchdown. Lynch ran for 102 yards, but didn't get the ball at the 1 on the decisive play - a decision the Seahawks will rue forever. The teams got down to football under the open retractable roof at University of Phoenix Stadium - the first venue to host an indoor and an outdoor Super Bowl - after dealing with distractions far beyond the typical Super Bowl hype. The Patriots are being investigated for using under-inflated footballs in their 45-7 win over Indianapolis in the AFC championship game. It was a game of spurts by both teams, at times looking like a Patriots blowout, then appearing to be a repeat coronation for Seattle, which had a vast majority of the fans among the 70,288. Jeremy Lane made the first big play to negate a nearly eight-minute drive by the Patriots with a leaping interception at the goal line late in the first quarter. Lane, a third-year backup Legion of Boom member, made his first pro interception, but left with a wrist injury after being tackled by Julian Edelman. His replacement, Tharold Simon, got torched by Brady for much of the remainder of the contest. Wilson was getting no time to look downfield and he didn't get off a pass in the first quarter. When Brady completed his record 50th postseason TD throw, 11 yards to Brandon LaFell against Simon, it was 7-0. Seattle went to its bench to help tie it. Matthews' first career catch, a reaching 44-yarder over Kyle Arrington and by far the longest first-half play for Seattle, led to Lynch's bruising 3-yard TD run to make it 7-7. But Brady to Rob Gronkowski made it 14-7 and seemed to finish off a dominant first half for the Patriots. Except no one told the resilient Seahawks. A dormant offense turned dangerous in a span of 29 seconds, covering 80 yards in five plays, including a late gamble. After Lockette caught a 23-yard pass and Arrington was flagged for a facemask, it put Seattle at the 10 with :06 remaining. Never one to shy away from a challenge, coach Pete Carroll went for it and the new Seahawks hero, Matthews, grabbed Wilson's pass in the left corner of the end zone. It was the most lopsided halftime tie imaginable. Then Seattle stormed to a 24-14 lead in the third quarter on Steven Hauschka's 27-yard field goal and Doug Baldwin's 3-yard reception from Wilson. New England was stumbling - until Brady once again stepped up. "It was a lot of mental toughness," Brady said. "Our team has had it all year. We never doubted each other, so that's what it took." After Tom Brady threw an 11-yard touchdown pass to LaFell, the Seahawks responded with their best drive of the game. Matthews - who made the crucial onside kick recovery in the NFC title game - made a twisting catch over Kyle Arrington for 44 yards to the Patriots 11. Two runs later, Lynch scored on third-and-goal. Brady bounced back after throwing an interception in the end zone to throw his NFL record-setting 50th postseason TD pass on the next drive. Brady picked on cornerback Tharold Simon, who replaced the injured Jeremy Lane on the drive. Brady engineered a 58-yard drive that lasted 7:20 before throwing a pick from the 10 on third-and-6. Brady threw off his back foot and took a crunching hit from Michael Bennett and Cliff Avril after he released the ball. Lane made his first career interception and weaved his way to the 14 before Julian Edelman knocked his own helmet off while making the tackle. Lane went to the locker room after being injured on the return. After getting one first down, New England punted. Later in the quarter Patriots quarterback Tom Brady was picked off in the end zone, though Seattle was unable to capitalize. The teams got down to football under the open retractable roof at University of Phoenix Stadium after dealing with distractions far beyond typical Super Bowl over the past two weeks. The Patriots are being investigated for using under-inflated footballs in their 45-7 win over Indianapolis in the AFC championship game. Meanwhile, star running back Lynch was a daily sideshow for the Seahawks this week because he refused to answer questions from the media. In the 12th matchup between No. 1 seeds since 1975 and the second in a row, the Seahawks (14-4) are trying to become the first team to win consecutive Super Bowls since the Patriots (14-4) a decade ago. Seattle routed Denver 43-8 last year. The Patriots have tied Dallas and Pittsburgh for most Super Bowl appearances with eight. They're trying to become the sixth franchise to win at least four. Brady and coach Bill Belichick - the only coach-QB combo to reach six together - led the Patriots to three Super Bowl titles from 2001-04, but lost twice to the New York Giants in 2008 and 2011.